Looking at this photo of my brother and me holding a pail of water while walking up the hill in front of our house, I estimate that this book is close to forty years old. How is it possible that I can remember an event from forty years ago? Why is it that my memory of that day is so clear? Maybe because I thought it was really special that I was able to help my Mother with her school project for a change. Or perhaps it was fun getting dressed up and having my picture taken. With further thought, I realize it’s probably because of lessons learned that day. · School projects can be fun. · You are never, ever too old to play. Creativity makes the world a better place. 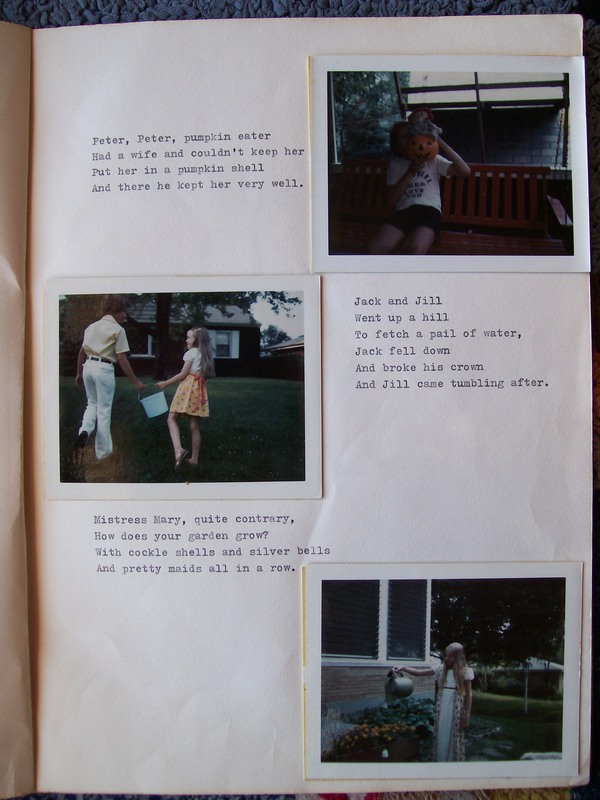 Looking closely at the photos of me and my siblings acting out Mother Goose rhymes for my Mom’s book, I see some very familiar items. My brother’s Mellow Yellow record player is sitting on a table in his room. I remember listening to John Denver albums on it. I have fond memories of that old playhouse that used to be in the back yard! And that child-sized rocking chair? It’s still in my parent’s living room! 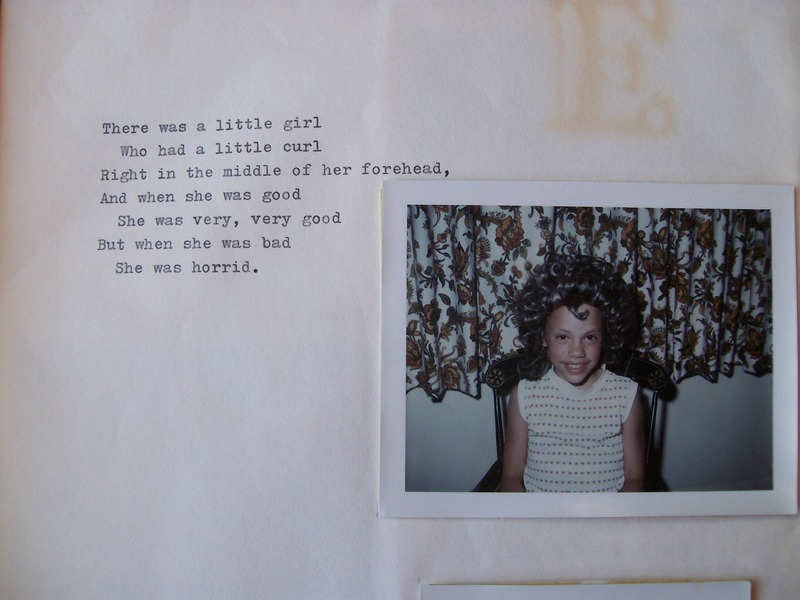 What’s really scary is that I think I still have the wig that I’m wearing in the photo depicting “There was a little girl who had a little curl”. Maybe it’s time for a re-creation of that photo! The most creative part of this old book is the last several pages where Mother Claus wrote in a few original rhymes and limericks. Mother Goose rhymes can teach young children so much – rhythm and rhyme, counting skills, memorization, beginning storytelling – just to name a few. But they can also just be fun! Why not create your own rhymes with photos of your children? Make a book that they will treasure many years from now!